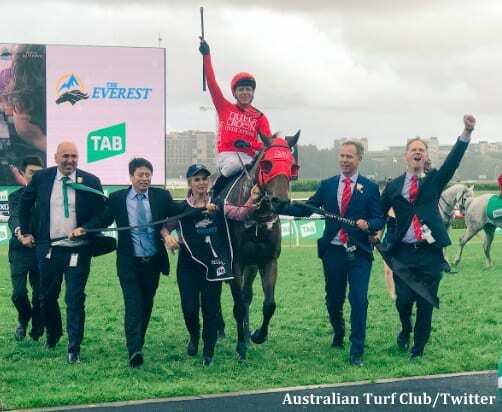 Redzel defeated favorite Shoals to win the Au$13 million (US$9.25 million) Everest Stakes at Royal Randwick, securing the 1200m (about six furlongs) victory for a second year in a row. According to news.com.au, the gelding paid $8.50 to win. “Three (in a row) would be too much to ask for. I'm going to lap up today. Big congrats to (son) Paul. He has helped me a lot with the horse,” said co-trainer Peter Snowden. Redzel's career earnings are now Au$15,372,000 (US$10,937,000), passing Makybe Diva's $14,526,690 to move into second on the all-time prizemoney list behind Winx with $19,884,924. This entry was posted in NL List, Racing and tagged everest, Kerrin Mcevoy, makybe diva, Peter Snowden, redzel, Royal Randwick, shoals, the everest, winx by Paulick Report Staff. Bookmark the permalink.